William Hill Plus Card – I have taken £60 in freebets from this! The FIFA World Cup 2018 is almost upon with the opening game kicking off on Thursday 14th June between host Russia and Saudi Arabia. Since the end of the 2017/18 football season, the World Cup has become ever more highly anticipated and I am certainly very excited about the tournament getting underway. This article aims to give you an insight into the world of matched betting ahead of the 2018 World Cup and what you can expect to happen during the tournament. For Cheltenham 2018, I made a profit of £1,245.00. I expect something similar from just the World Cup offers. A lot of what I will be doing for the World Cup will be shown in this article. Smarkets have enhanced their sign up offer from the usual £10 bonus upon signing up to a whopping £70 in bonuses overall for the World Cup! The terms for this incredible sign up offer can be found by clicking here. If you haven’t yet joined Smarkets, now is a fantastic time to do so and you can get the £70 in bonuses by clicking here. I am an Oddsmonkey premium member and there are already several reload offers for the World Cup which can be found on their reload offer section. From the pre-tournament offers alone, I have already got £200 in freebets ahead of the World Cup which I cannot yet use until 14th June. I wouldn’t have this many freebets beforehand if I was not an Oddsmonkey member because of the many great reload offers posted on their site. 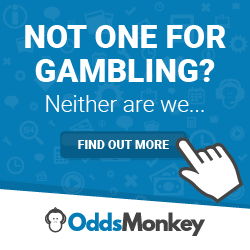 You can try Oddsmonkey out for just £1 for the next 7 days by clicking here. A few weeks ago, I was driving in the car and drove past my local William Hill who had a gazing sign outside their window saying “Bet £30 get £20 for the World Cup”. As a keen matched bettor, this certainly caught my eye and I made the effort to go in and ask what it was all about. All I had to do was sign up for a plus card and bet £10 on the Champions league final, the FA Cup final and the Europa League final. Once the bets settled, I will receive £20 in freebets from the 14th June on my plus card. Easy! Not only that but from linking my Plus card to my online William Hill account, I also got £40 in freebets on top of this. Altogether, I should make around £45.00 from this offer alone. Some of the great offers I have seen for the World Cup are offers where you bet on the outright winner to actually lift the World Cup trophy. Personally I am not a gambling person but I believe Brazil will win the 2018 World Cup. Therefore picking them on outright winner markets is a good idea and I will share with you some of the offers I have seen. One of the offers I have seen is where you back an outright winner and every time that team wins, you will receive a £5 freebet. This means you could potentially get £35 in freebets if your team wins every game they play in the 2018 tournament. There is also a similar offer where you can bet on the outright top goalscorer and every time they score you will receive a £5 freebet. These two awesome offers are available at William hill online AND the Plus card in William Hill shops. This means you could get a £10 freebet every time your team wins or player scores. I recommend going for a player to score from the Nation you back to win the tournament outright. When I do this offer, I will be looking at backing Neymar and Brazil. If Neymar scores 4 goals (like he did in the 2014 World Cup) that could be £40 in freebets and then a £10 freebet each time Brazil win on top! This is pretty good value. For the past 2 weeks, there have been loads of great value reload offers where you bet on football games before the World Cup even begins. One on offer, I will get £30 in freebets by just betting on the correct scores on 2 of England’s friendly international games against Nigeria and Costa Rica. William Hill appears to be the number one bookmaker which I have used so far for the Pre-tournament offers. They offered a £5 freebet when you bet on the final game of the Premier League season, the FA cup final and the Champions League final. That’s £15 in freebets already. I also did another good offer where you bet £50 with Bwin and you get another £15 in freebets for the World Cup. These are just a few of the offers I have qualified for ahead of the World Cup. As mentioned, I have £200 in freebets already and still room for some more freebets before June 14th. Assuming an 80% retention rate, this means I could expect to make £160.00 profit from these freebets. Happy days! If you have joined a few bookmakers and given them your email address, you will have received some updates from them via email. You must make sure you keep an eye out on your emails during the tournament and even now too! Bookmakers will likely post loads of offers during the tournament and there will be some amazing reload offers as the World Cup draws to the later stages (knockout rounds). Since the start of June, I have had offers emailed to me almost every day from different bookmakers and have these emails flagged for me to do as the tournament starts. Ultimately your goal as a matched bettor is to get on as many reload offers as you possibly can. The more offers you can tackle at once, the more profit you should expect to make. Combining your email inbox with your Oddsmonkey premium membership will ensure you have LOADS of reload offers coming your way. Some reload offers come to your email inbox specifically to you that wouldn’t be on Oddsmonkey and some offers won’t come to your inbox that will feature on Oddsmonkey. Therefore, this will ensure you have the best possible information coming your way for the World Cup and increasing your chances for a much more substantial profit. The World Cup only comes around once every four years. Therefore based on the law of supply and demand, this suggests there will be many people watching the World Cup and potentially betting on the World Cup. Just like with Cheltenham, the bookmakers will be keen to take as many people’s bets as possible and they will also offer great incentives (offers, bonuses and freebets etc) to get people betting with them. This will apply to both new customers and existing customers. Reload offers, reload offers and reload offers. Stay tuned to your email inbox and jump on board Oddsmonkey to give yourself the best chance of making a lot of money from this year’s World Cup in Russia; without risking your money of course! Use the pre-tournament offers too to get yourself a handful of freebets before the first game on 14th June. This is what I have done and I already have £200 in freebets before the first ball is kicked in Russia. Again don’t forget to join Oddsmonkey by clicking here. Grab your £70 in bonuses at Smarkets by clicking here. Grab your copy of Corkie’s Additional bookmaker list by clicking here. Great stuff Corkie, people should really really getting prepared for the World Cup. IT’S TAX FREE HOLIDAY MONEY! Great info as always Adam! Let’s get in it! Each way arbing, my guide to profiting from arbitrage betting!